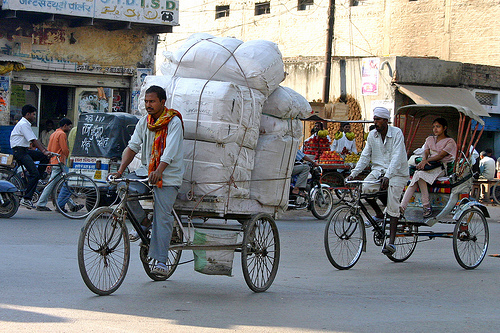 Load carrying bikes in Varanasi, India. Photo by dirk huijssoon. This post is part of a series analyzing the solutions highlighted in the report and toolkit, “Megacities on the Move.” The report, written by Forum for the Future in partnership with FIA Foundation, Vodafone, and EMBARQ, offers six sustainable mobility solutions for massive cities that include examples of solutions currently in practice and those in development. For a summary of the report and more information on the project, check out a previous post on TheCityFix. Mobility systems must work for everyone – the rich and the poor. Too often low income people and neighborhoods are isolated from good transportation, further hindering employment opportunities and access to goods and services. The “Megacities on the Move” report suggests that “everyone in the mobility sector will have to design tailored mobility solutions that meet” the needs of low income people. ensuring that public transport is accessible to people with disabilities, since in developing countries these users are likely to be the poorest. “I think addressing these three needs is as important as thinking about custom technology for the poor,” Carrigan summarizes. In addition to creating services that are accessible and affordable for the poor, it’s also important to include the poor in the planning process. To give businesses, planners, developers and people in academia the loudest voice in the process ignores the needs of marginalized and often vulnerable populations. The cities of Medellín in Colombia as well as Caracas in Venezuela have built cable cars to improve the connectivity of slums to the urban core. This elevated transit system provides a transit service to barrios clustered on steep hillsides inaccessible by cars or conventional mass transit. This technology is not uncommon in the developing world, where slums are often clustered along a city’s edge or on precarious terrain. Often these informal settlements have impassable streets and nonexistent road infrastructure. The benefits of a car cable system are that they are low-emission transport systems, easily integrated into the cityscape and accessible to the disabled. Opened in 2006, the Medellín Metrocable “was designed to reach some of the least developed suburban areas of Medellín…” This solution, highlighted in the “Megacities on the Move” report, has practical applications for hard-to-reach and dense urban settings, but it is not a solution for the poor specifically, but rather for a specific geography that happens to have slums. Yet these cars have improved quality of life and mobility in Medellín. The system has reduced motorization, particularly of motorcycles, the vehicle most residents in these slums use to maneuver along the crowded roads. This has reduced tailpipe emissions and improved street safety. According to a resident quoted in a Christian Science Monitor article, the Caracas cable car located in the city’s “poorest and most violent barrios” has reduced the commuting time of some from two hours to 40 minutes. In New York City, considered the U.S. city with the best and most affordable public transit, a recent study by the Pratt Center revealed that the city’s lowest paid workers have the longest commutes because high housing costs have forced residents to live farther away from the city’s subway-rich core. The Subway is the primary and most efficient mode of transit for New Yorkers to get around the city. (32 percent use the subway and 14 percent use the bus, according to Wikipedia.) Additionally, low income workers with service and manual jobs tend to commute to sites dispersed around the region far from the subway. New York’s solution has been to implement BRT and new bus service routes that reduce the isolation of certain city neighborhoods. For more on the report, check out a recent post on TheCityFix. Transportation needs to be affordable. Unlimited monthly passes or time-based rather than distance-based fares help encourage low income users to use the most efficient mode of transit rather than simply the cheapest. Distance-based fares can penalize the poorest transit users, who tend to live in the townships or slums on the outskirts of town and have to travel long distances or make many transfers. The base transit fare and fare structure should be set so that the poorest, most transit dependent users are not penalized. Bicycles can be used for utilitarian purposes as well, as many load-carrying bikes, when affordable, enable people to be be mobile and do business more cheaply. Walking and biking infrastructure that is well-designed, useful and encourages vulnerable users to walk, bike and use mass transit can be the path to affordable mobility. Community-based participatory research is a ground-up approach premised on community participation and the translation of research findings into action for social change. Resident input is used to orient research in the design phase and to garner feedback from a broad community. The process itself is not only about empowering residents (because it recognizes local knowledge and assets in a community), but it also provides an opportunity for under-privileged populations to voice input on issues of concern that may be overlooked in a top-down planning process. This type of research involves residents in all aspects of the design and implementation of research projects. Unfortunately, this approach to research is far more common in the public health field, which tends to focus more explicitly on behavior analysis. Another project, RioOnWatch, was developed by a nonprofit in Rio de Janeiro to give voice to the residents of Rio’s favelas (slums) as the city prepares for the 2016 Olympics. RioOnWatch is the English-language version and favela.info is the Portugese version of the blog that focuses on interactions between the government and local populations. It provides information on how the decisions made by government and corporations for the mega-sporting event will impact communities around Rio in the period before and after the Olympics. RioOnWatch points out that breaking ground for much of the necessary infrastructure for the Olympic Games will displace thousands of people and those people need to have a voice in how this construction will impact their communities. Although new technology will be valuable in addressing the future needs of low income populations, simple solutions like building transit or linkages to mass transit in low-income communities, making sure transit is designed to be universally accessible to the disabled, promoting walking and biking, and using processes like participatory planning can ensure that the poor have voice and value in transit systems. Write comments or tweet us @thecityfix with your ideas for future sustainability solutions in megacities.